On the bike or on foot, this is not the kind of sight you want to come across anywhere, let alone near a struggling residential neighhborhood where people are trying to spruce things up. 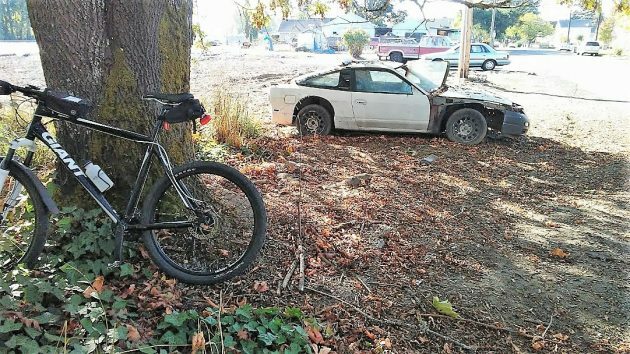 This junked car, in the 1900 block of Second Avenue S.E., I happened to see the other day as I detoured from my regular bike route through Albany’s Willamette Neighborhood. Then, a few days later I went that way again and it was still there. I asked Marilyn Smith in the city manager’s office at City Hall if this had come to the attention of the city’s code squad or if anything could be done about this kind of blight. She said she would forward the photo to the police department’s Community Resource Unit. The vacant parcel at the southeast corner of Second and Chicago is owned by the BNSF, according to county tax records (which give the address as 215 Chicago N.E., which I think is a mistake since this is south of First and therefore in the southeast quarter of the city). “We have had infrequent success with getting the attention of railroads when people dump stuff on their properties, but we always try,” Marilyn told me. She said code enforcement officer Kris Schendel had recently put a lot of work into getting this area cleaned up. 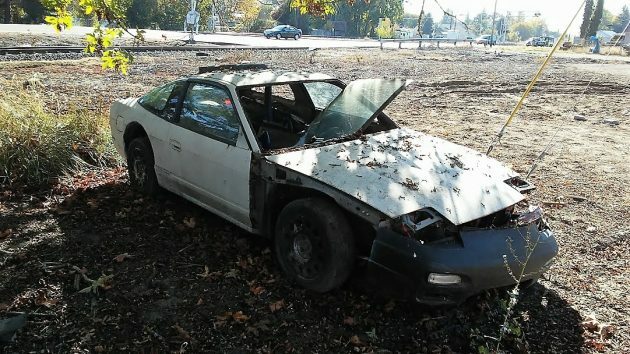 There is salvage people that would pay something to get the vehicle. The problem with “someone” removing it is that no wrecking yard will take it w/o a title. It would literally have to be cut up in pieces for even Burchams Metals to take it. Being on a R/R right-of-way puts the ball in the R/R’s court to do something about it. If they won’t fix the Queen Ave R/R crossing do ya really think they will get this car removed any time soon??!! The railroads believe they are above the law and in a lot of ways they are. Move the car onto the tracks and see how long they take to move it. If you’re looking for auto blight…. check out the “road closed” Timber street between Hey. 20 and Spicer. Ugh.